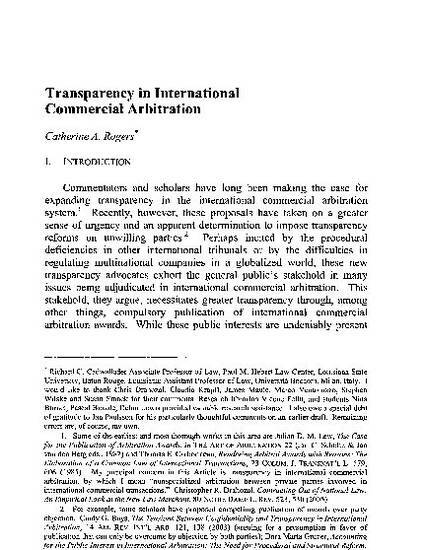 Scholars have long been making the case for expanding transparency in the international commercial arbitration system, but recently these proposals have taken on a greater sense of urgency and an apparent willingness to forcibly impose transparency reforms on unwilling parties. These new transparency advocates exhort the general public's stakehold in many issues being arbitrated, which they contend necessitates transparency reforms, including compulsory publication of international commercial arbitration awards. In this symposium essay, I begin by developing a definition of transparency in the adjucatory setting, and conceptually distinguishing from other concepts, like "public access" and "disclosure," which are often improperly treated as conceptually interchangable. I argue that transparency reforms forcibly imposed on the international arbitration system are impracticable because parties could effectively avoid them by resort to "gray-market" arbitration. Moreover, I argue that such reforms would be less likely to serve public stakeholds than disclosure obligations, meaning national regulatory requirements that parties disclose specific categories of substantive information. Focusing on the substantive information sought, as opposed to the procedures through which it is developed, and channeling reform efforts at the national level, avoids the political and practical difficulties in implementing system-wide changes at the international level. I also argue that, while there are limits to the effectiveness of disclosure obligations, it would be premature if not counterproductive to consider imposing transparency reforms. Unlike investment arbitration or other international tribunals, where transparency reforms were produced in reaction to public outcry and corresponding governmental pressure, a range of competitive and cooperative forces within the international commercial arbitration system have induced it on a tempered, but voluntary and steady march toward greater transparency.